The Philippines is a relatively minor coal producer but has a number of coal-fired power stations. The Philippine Department of Energy estimates that in 2005 coal-fired power stations accounted for 3,967 MW of the electricity generated in the country, representing approximately 27% of the total. In addition the cement sector accounted for approximately 20% of the country's coal consumption. The Philippine Department of Energy estimated that in 2005 approximately 7.28 million tonnes of coal was imported. The major sources of coal imports were from China, Indonesia and Australia. The U.S. Geological Service reports that in 2007 "production of coal was 3.72 million metric tons (Mt) compared with 2.53 Mt reported in 2006 (table 1). The increase in coal production was attributable principally to high demand in both the local and the world markets as the result of increases in oil prices". The Philippine Department of Energy reports that the largest coal producer in 2005 was the Semirara Mining Corporation (SMC) which produced approximately 92% of the total. Smaller mining operations were based on deposits in Cebu, Zamboanga Sibuguey, Albay, Surigao and Negros Provinces. The Philippine Department of Energy reports that in 2005 a joint project with the United States Geological Survey produced a report titled Assessment of Philippine Coal Bed Methane. The Philipppine Department of Energy stated that the report "identified several coals, from lignite to semi-anthracite, in the country that possess large gas storage capacity compared with coals in known coalfields in the US. With the gas holding capacity of coals in the Philippines coalfields known, a detailed study was proposed to determine the amount of Coalbed Methane (CBM) resource and prove recoverable reserve potential. Coalbed methane is an emerging natural gas resource that has evolved worldwide as an alternative clean-burning fossil fuel." As of 2012, environmental conservationists are seeking issuance of an environmental protection order for the construction of coal ash dumps away from water bodies and the submission of reports on disposal of coal ash. The petitioners include the Philippine Earth Justice Center Inc., Central Visayas Farmers’ Development Center, Central Visayas Fishefolks Development Center, and concerned citizens of the cities of Toledo and Naga. The claim is aimed at Kepco-Salcon Power Corp. (KSPC) and Salcon Power Corp. (SPC), owners and operators of two coal-fired power plants in Naga City, as well as Toledo Power Corp., Cebu Energy Development Corp., and Global Business Power Corp.
On August 17, 2010, Judge Yap issued a 72-hour temporary environmental protection order (Tepo) on the dumping of coal ash outside the premises of coal-fired power plants in the cities of Naga and Toledo. In March 2011, the Tepo was extended indefinitely, as owners and operators were told to dump coal ash only in court-designated areas. The order was issued after the court inspected the coal-fired power plants, their disposal facilities, and other dumping sites identified by the petitioners, which are now seeking a permanent environmental protection order against the power companies to ensure safe coal waste disposal. On May 8, 2011, a ship loaded with coal ran aground and destroyed a large portion of a marine sanctuary in the southern Philippines, damaging coral reefs in the Sarangani Bay. The Panamanian-registered ship with 21 Filipino crew members was headed to India from Australia carrying 65,000 tons of coal. An investigation showed the ship’s crew miscalculated its path and sailed into shallow waters. On its website, the Philippine Department of Energy rhetorically asks "How do you plan to address mounting opposition on coal?" In response it states that "in order to address environmental concerns, the DOE shall encourage operation of coal power plants that utilize clean coal technologies. There will be efforts to educate the public on the real impact of and the available mitigating measures for coal operations." In April 2010, local community members in Cantilan, Surigao del Sur, led by Mayor Tomasa Guardo, led a protest action opposing mining activities in the area by Marcventures Mining and Development Corp. (MMDC), setting up a picket line adjacent to the road leading to the mining. The protest action in Cantilan is among several protest actions occurring around the country calling for a ban on large-scale mining in the country. Protesters believe that mining in Important Biodiversity Areas (IBAs) such as Mount Hilong-hilong, which covers the forest in Cantilan, is detrimental to the diminishing wildlife in Surigao del Sur. 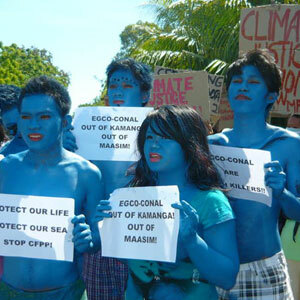 On Earth Day 2010, 4,000 environmentalists protested in solidarity with rallies in Tampakan, South Cotabato, and Maasim, Sarangani, against the proposed Kamanga power station by CONAL Holdings, and mining activities in these provinces. Protesters in Sarangani included leaders of religious groups, fishermen, indigenous people, and foreign divers who said the project will destroy the waters of Maasim, because of the area's ecologically important coral reefs. Mindanao State University students dressed as Na'vi from the film Avatar marched toward the fenced property of the proposed plant site. The protesters and media were refused entry to the CONAL Community Development Office. A slight commotion occurred when four unidentified men suspected to be working for CONAL were seen with cameras, video recorders and handheld radios at the rally. Elson Helsa of Maasim Peoples Coalition on Climate Change (MP3C) expressed fears CONAL might finance local candidates who supported the setting up of the plant. Sarangani Gov. Miguel Dominguez, Maasim Mayor Aniceto Lopez Jr., and Kiamba Mayor Rommel Falgui announced their support to the project during a community consultation held in 2009. In Tampakan, the protest started with a prayer rally followed by a press conference calling for a stop to the mining activities of XTRATA-Sagitarious Mines Inc. The protesters demanded the pullout of XTRATA-SMI and called for sustainable development, the protection of watersheds and respect for indigenous people’s rights. In May 2010, a Greenpeace activist participating in a peaceful protest against a coal power plant outside Manila was beaten by local plant security, who drew weapons and fired warning shots at people armed with nothing but a banner. Four other Greenpeace activists were hospitalized after having stones thrown at them. In November 2010, with the aid of Greenpeace activists a 75-boat flotilla and a human banner with an estimated 800 participants were formed in the town of Massim, Saranganito, a Philippines province. The group gathered to protest the development of a proposed 200-megawatt coal-fired power plant of Alcantara Group-led Conal Holdings Corp. In March 2011, residents of Binugao village in the Toril district asked the city government to reject the proposal of Aboitiz Corp. to put a coal-fired power plant in the village. In early March, the city council approved on first reading the proposed project and forwarded it to the committee on energy, the committee on environment, the committee on health, and the committee on trade and commerce. The four committees were tasked to conduct public consultations on the proposal. Vice Mayor Rodrigo Duterte has been very vocal about his endorsement of the proposed 300-megawatt coal-fired power plant, even before the conduct of any study. His daughter, Mayor Sara Duterte, said she was personally opposed to the project although she would go with the decision of the people. Dr. Jean Lindo, one of the convenors of the No to Coal Davao, said the Aboitiz’s statement that the project would not pollute the environment was “a total statement of fallacy and deception” and “There is no such thing as clean coal." A petition submitted to the city council by those opposing the project states that 10 coal-fired power plants have been set up all over the country. They said "We, as Filipinos and energy consumers, have a right to demand for clean, renewable and affordable sources of energy without compromising our right to a healthful environment and genuine development,” the petition said. A protest is planned for August 29, 2011, against a proposed 600-megawatt coal power plant inside Subic Bay Freeport, citing pollution and health problems as the main concern. Alex Hermoso, lead convener of the Olongapo-Zambales Civil Society Network, said that they are expecting more than 2,000 participants to attend the protest action. The Subic Bay Freeport Chamber of Commerce (SBFCC) has been split in its opinion regarding the coal power plant project, with members of the SBFCC whose business is mostly related to tourism largely opposing the project. Citizens say the project has been pushed through without social acceptability: “The network of oppositors, particularly the multi-sectoral Olongapo-Zambales Civil Society Network, affirms its stand against the coal-fired power plant and will never raise the white flag. The proponents and supporters of the coal-fired power Ppant have not yet seen the real campaign against it.” The local government of Olongapo City and the Zambales Provincial Government have both approved a resolution opposing the coal power plant. ↑ 1.0 1.1 1.2 1.3 "Coal...", Department of Energy, May 2010. ↑ "Energy resources: Coal", Philippine Department of Energy website, accessed may 2010. ↑ Philippine Department of Energy website, 'Coal Statistics", Philippine Department of Energy website, accessed May 2010. ↑ Philippine Department of Energy website, "Coal Statistics: Coal importation by country", Philippine Department of Energy website, accessed May 2010. ↑ Yolanda Fong-Sam, 'The Mineral Industry of the Philippines". U.S. Geological Survey, September 2009. ↑ "S. Cotabato’s prohibition on open-pit mine method worries Energy department" Business World, April 19, 2011. ↑ "Environmentalists, power firms explore conditions on coal ash dumping" Sun Star, Jan. 11, 2012. ↑ "Ship carrying coal runs aground, destroys coral reef in Philippine marine sanctuary" Washington Post, May 12, 2011. ↑ Roslyn Arayata, "Climate change, mining and Mimaropa" Manila Times, May 2, 2010. ↑ 11.0 11.1 11.2 "Rallies vs coal plant, mining mark Earth Day in Soccskargen" Yahoo! News, April 26, 2010. ↑ "Activists attacked in Philippines global warming protest" Greenpeace International, May 21, 2010. ↑ "Residents oppose coal-fired power plant project" Business World, November 21, 2010. ↑ 14.0 14.1 Jeffrey Tupas, "Davao City residents oppose building of coal-fired power plant" Inquirer Politics, March 10, 2011. ↑ "Protest action set in Olongapo for Subic coal plant" Sun Star, Aug. 28, 2011. This page was last edited on 29 May 2014, at 01:46.